Crop Tops are at the top of my spring “Must Haves!” They are the perfect staple item for your spring wardrobe. The thing I love most about crop tops is that they can be dressed up or down creating a casual or cocktail look! This crop top is one of my favorites. The first thing that attracted me to it was the soft peach color. Pastels are so simplistic and easily paired with other colors. My absolute favorite part of the top is the lace embellished detail on the shoulder and back. Lace is very trendy this spring, with many designers using it to enhance their designs. The lace detail added the perfect finish to this top. 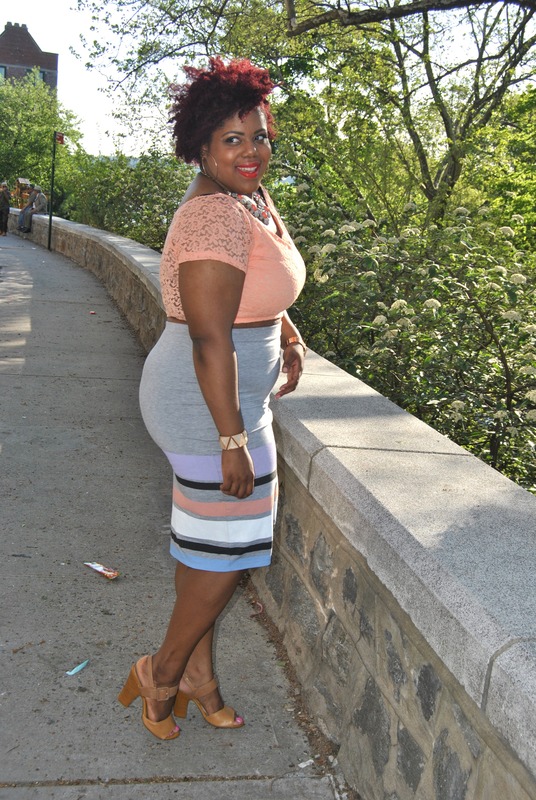 This mid length pencil skirt features bold pastel stripes which are perfect for spring. I chose peach as my top color to highlight the bold peach stripe in the skirt. I finished my look with a statement necklace and heeled sandal. You look GREAT her and I love it all including your hair! Thank you! Thank for reading!